Loops are used in programming to repeat a specific block of code. In this article, you will learn to create a while loop in R programming. In R programming, while loops are used to loop until a specific condition is met. 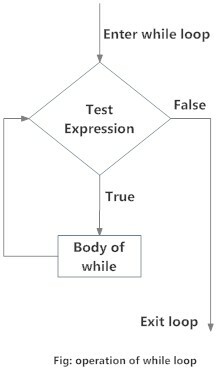 Here, test_expression is evaluated and the body of the loop is entered if the result is TRUE. The statements inside the loop are executed and the flow returns to evaluate the test_expression again. This is repeated each time until test_expression evaluates to FALSE, in which case, the loop exits. In the above example, i is initially initialized to 1. Here, the test_expression is i < 6 which evaluates to TRUE since 1 is less than 6. So, the body of the loop is entered and i is printed and incremented. Incrementing i is important as this will eventually meet the exit condition. Failing to do so will result into an infinite loop. In the next iteration, the value of i is 2 and the loop continues. This will continue until i takes the value 6. The condition 6 < 6 will give FALSE and the while loop finally exits.